It is widely recognised that hospitality managers need to develop excellent financial skills in order to manage costs and drive profitable revenue as well as budget and forecast effectively. The team at arena4finance have had many years of experience developing and delivering one day and more extensive courses in hospitality finance for both finance professionals and operational heads of department in hotels, restaurants and leisure facilities. We regularly provide training support for recognised industry bodies including the Institute of Hospitality, the MasterInnholders, TUCO and the Association of Public Service Excellence. All courses are based on the recommendations of the 11th edition of the Uniform System of Accounts for the Lodging Industry. Debra Adams, Head of Professional Development at arena4finance, has been involved with the hospitality industry for almost 30 years and has delivered courses and training to numerous organisations in the hotel and restaurant sector. 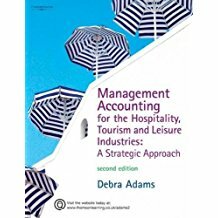 She is the author of the highly acclaimed text book 'Strategic Management Accounting for the Hospitality, Tourism and Leisure Industries'. She is also a regular speaker at conferences and business seminars. These courses are available both for workshop delivery and online. For more information contact us for an informal discussion at hello@arena4finance.co.uk or on ++ 44 (0) 1202 849691.